November is the big month for festivals, at least for all those interested in photography. Every two years—and this year once again—numerous European cities host the Month of Photography. This time, Vienna gave the festival its own name. Read more about this in the 72nd issue of EIKON in an interview with festival director Thomas Licek. EIKON will be present at the festival participating in two events: at the traditional yearly EIKON Photography Breakfast, an initiative in cooperation with Fluss from Wolkersdorf, experts will discuss Environmental Art from Finland. And EIKON’s SchAUfenster, a showcase for our magazine, will be a site of longing for the next three months: by directly illuminating the wall, BIRGIT GRASCHOPF makes the space itself the support for her work. Read more about her interdisciplinary approach to art in our Artist Pages, where you can also find out how ANTON KEHRER takes photography to its limits. His work, which reflects on the nature of the media, can be compared to that of a writer who creates poetry using simple words. 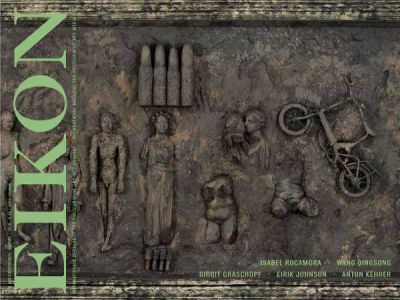 The American EIRIK JOHNSON in turn presents his landscapes in a novelesque way: in so doing, stories emerge with scenes and characters, full of action, episodes, and interruptions. The Spanish-British video artist ISABEL ROCAMORA is concerned with the performative language of gestures and their relationship to the individual and cultural identity. In her brand new, previously unreleased film, she shows the psychological conversion of soldiers during military training. WANG QINGSONG stages life-sized tableaux vivants in elaborate settings where figures from well-known works of art history become a living homage to the West. New York’s ICP will dedicate an extensive exhibition to the artist in 2011. EIKON visited Wang at his studio during the first ever PhotoSpring Beijing. For more on this festival, read our Forum, where you can also read an interview with VALIE EXPORT, Austria’s grand dame of media art, who is celebrating her seventieth birthday this year. Read too about the films made by actress Andrea Eckert, the auction results achieved by Jerry Hall’s collection on the art market, and take a look at our extensive exhibition reviews, which again will include shows from across the world, from Vienna, London, and New York.